One of the best kept secrets of the world's best dressed women is to have a great wardrobe, and here at Masterbuild we can supply you with exactly that. 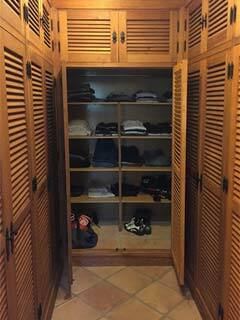 The wardrobe as we know it today originated when wealthy people used to keep their clothes and shoes in a wooden chest, and this soon developed into using a whole room for the same purpose. The name 'wardrobe' was given to a room in which space was filled with closets and lockers full of personal items. In the 19th century, when wardrobes became more common place, they were added to and improved with drawers, hanging spaces and shelving. Nowadays wardrobes come in all shapes and sizes, colours and styles. Here is an example of an original style wardrobe that we built to fill an entire small bedroom of a house. Masterbuild has installed many types of wardrobes, storage units and cupboards for our clients over the years and can advise not only on the best use of available space, but also the most effective layout of the internal space of a wardrobe. If you would like to talk to us or even to ask for some advice or information, please complete the form below. One of our team will be in touch with you shortly. NOTE: In order for us to be able to help you most effectively, you must enter information in all of the above fields.